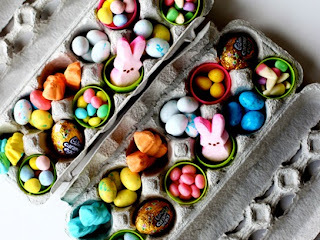 While browsing around the web looking for some simple Fall pick me up decorating ideas (I don't do much for fall because I do WAY to much at Christmas) I found these cute ideas. 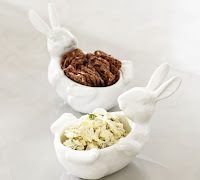 They appear easy, cute and cheap so I wanted to share just in case someone else is looking for some fresh new ideas! 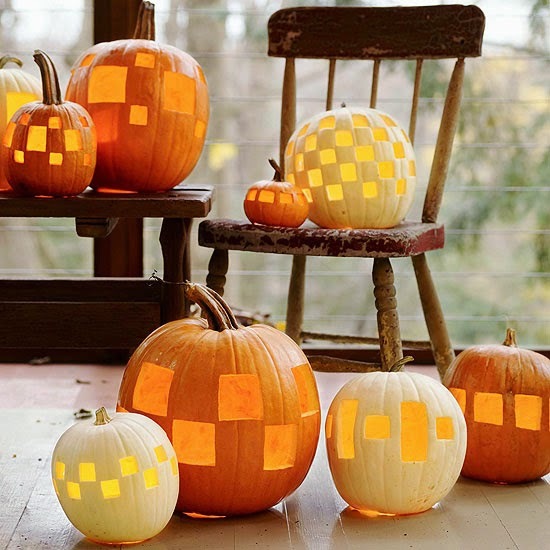 These pumpkins get a mod makeover from geometric cutouts in different sizes and patterns. 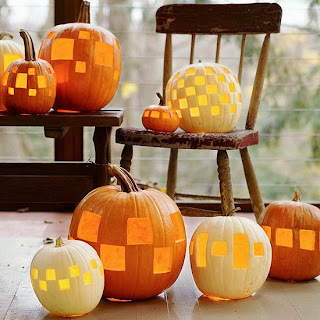 Just hollow out the pumpkins, then stencil on your designs. Cut out each square with a pumpkin carving saw and arrange on your front porch. 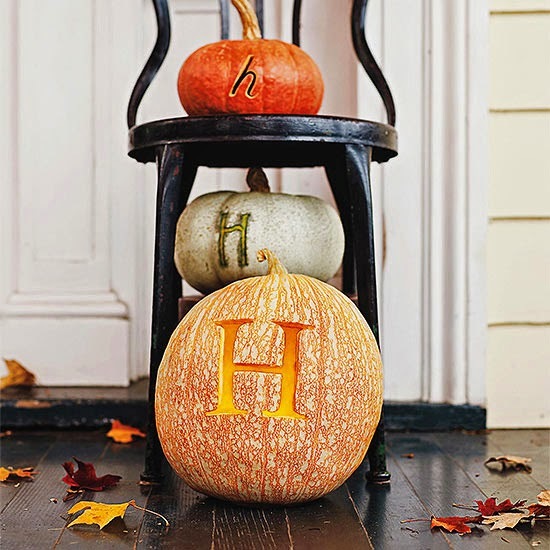 For a country-chic look, rest pumpkins on an antique wooden chair or bench. 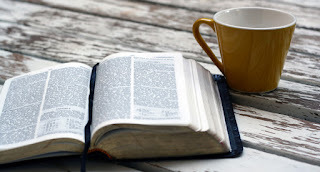 This is so simple and I love it! Give second life to a vintage find by hanging an old pitchfork on your fall door. Wire dried husks of corn on the prongs so you can remove them later if you like. 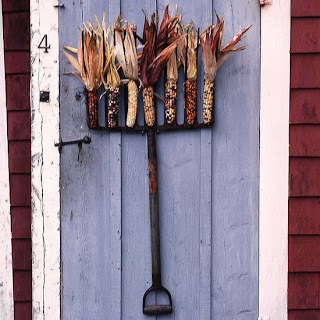 Use two long nailheads to hang the pitchfork to your door. You may need to add extra nails or use wire to ensure that the pitchfork is extra-secure if you're placing it on an often-used door. 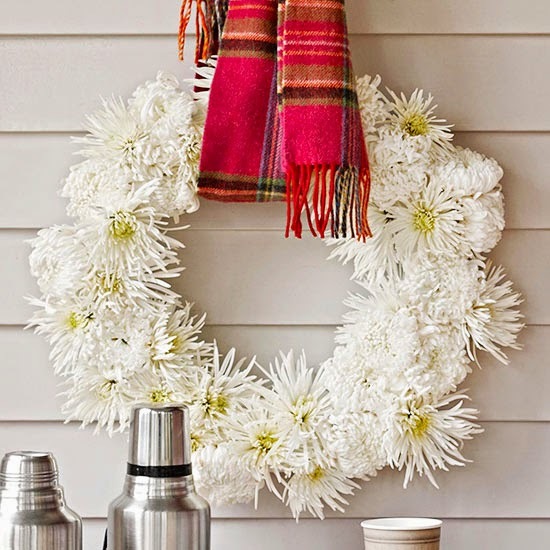 Warm up your fall porch with an easy-to-make wreath. To make, press spider mums with 1-inch stems into a foam wreath. The blooms will last a few days, especially if you spritz them with water a few times. Finish the look by hanging with a plaid scarf. 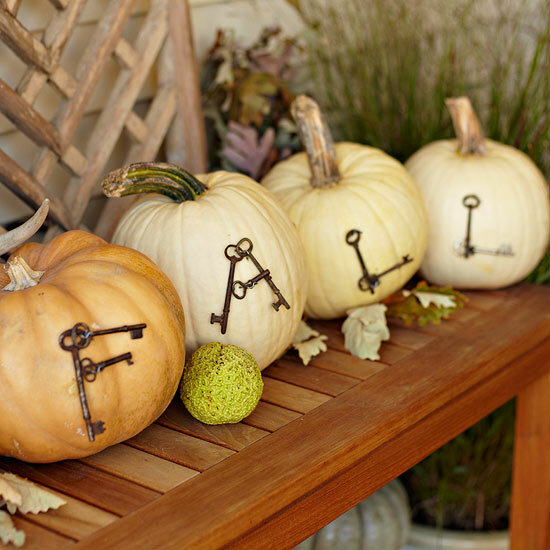 This year, carve personalized pumpkins to welcome your friends and family to your home. Buy a small, medium, and large pumpkin, then etch your monogram into each one. Try using different fonts and styles for a fun fall touch. 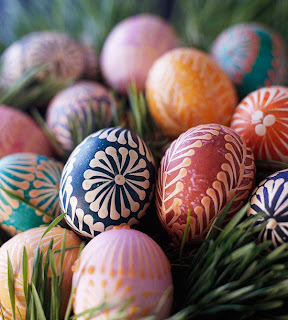 Rest your masterpieces on an old chair or stool to show off your work. LOVE this but you will have to use some man tools =) Give your front entry a bold accent for fall with a living monogram wreath. 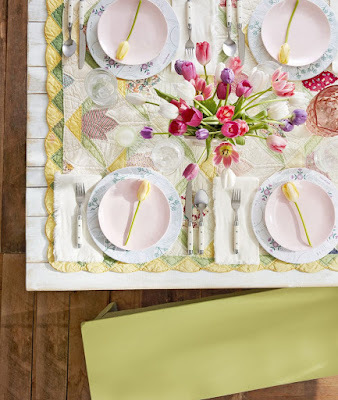 Construct a letter form from 2-inch cedar boards, a plywood back, and chicken wire. Spray-paint the form a bold color, then fill with sphagnum peat moss and succulents. 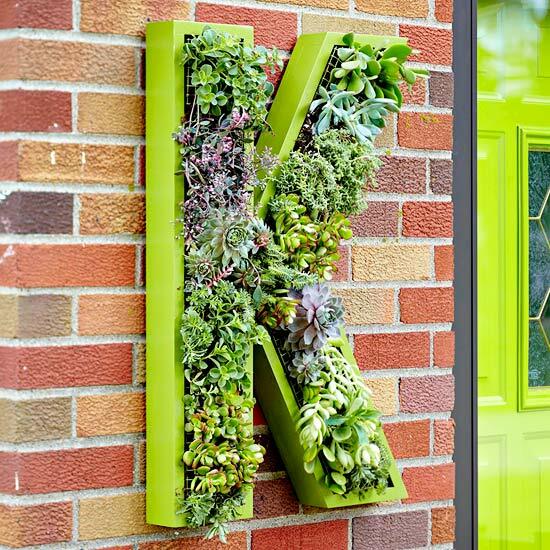 Add hooks to the back of the letter to make it easy to remove, clean, and add new plants. 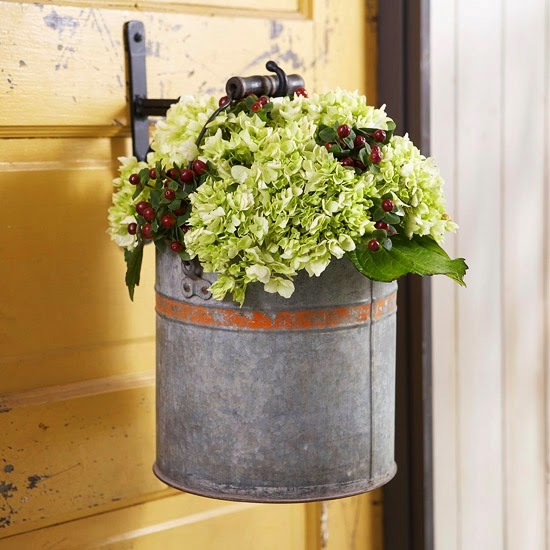 Seasonal freshness comes courtesy of live hydrangea and hypericum in this hanging bucket. Simply attach a decorative hook to your door and hang an antique bucket filled with water and the fall blooms. The seasonal display stays fresh for a few days -- enough time for your big fall gathering or for greeting unexpected fall guests. 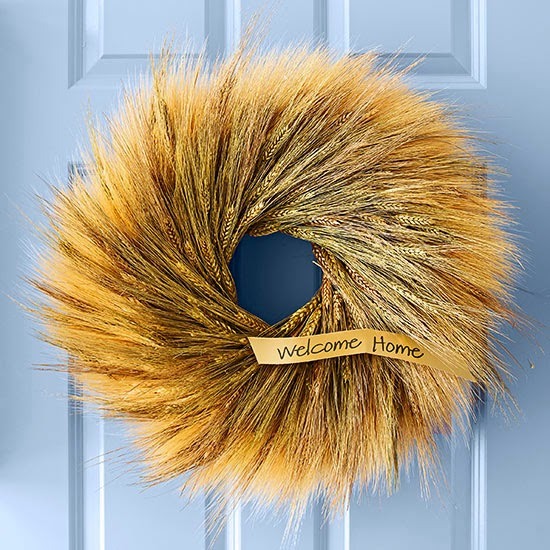 Add shine to a traditional harvest wreath with a touch of metallic paint. Divide purchased dried wheat into three groups. Lightly brush each group with a different color of paint (we chose gold, copper, and brass). Let dry, then tuck the stalks into a purchased wheat wreath, starting from the inside and working outward. Complete your creation by attaching a handwritten welcome to the wreath with hot glue. Add quick color to a fall decorating staple with chrysanthemums. To make, purchase 40-50 florist's vials (available at crafts supply stores). Cut a band of holes at different heights and about 1 inch apart around the middle of the pumpkin with a small sharp knife. Fill the vials with water and replace the rubber stoppers, then push the vials into the holes so they are just below the surface of the pumpkin. Cut your chrysanthemum flowers so they have 2-inch stems and remove the leaves. 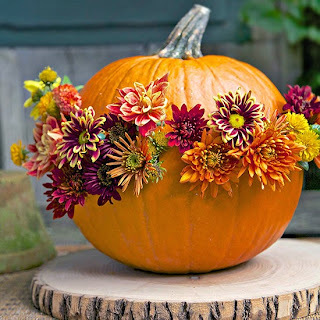 Give your pumpkin a floral border by inserting one or two flowers into each vial (the flowers should be big enough to cover the holes). TIP: In place of chrysanthemums, you can use thistles, wild asters, or faded hydrangeas. Use orange paper lanterns as an inexpensive and easy way to decorate your front entry for fall. 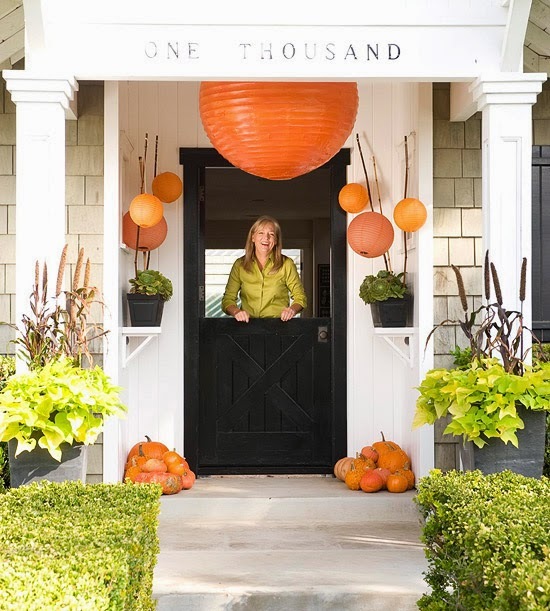 To re-create this look, affix smaller lanterns in various shades of orange to bamboo stakes using light-color string; put the stakes in planters on either side of the door. Continue to add symmetry with pumpkins in various sizes piled below the elevated planters. Make the look wow-worthy with a larger-than-life orange paper lantern hung from the center of the front entry. How Will You Accomplish Your Dreams?